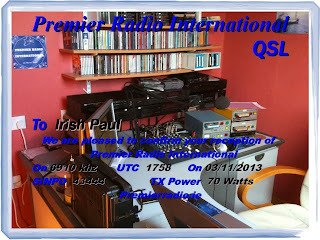 6290-10.18 Radio Waves International Country Music And Lou Reed" walk on the walk side". Strong Signal Sinpo 54444. Judging By The Strength Of The Signal It Must Be Via A Relay. 6286-17.00 Unid Playing Instrumental/ Tango Music. Weak Signal, With Some Fair Peaks Sinpo 33333. Maybe Radio Tango Italia. 6245-16.10 Unid With Music From Dire Straits And Fisher Z. Strong Signal Sinpo 54444.Closed Down Without Giving Out Id. The 2013 Pirate Radio Annual is now nearly finished and I'm taking advance orders for copies of the book. I've been finishing assembling and editing the audio tracks for this edition over the past few weeks and I just spent a couple of hours creating the master audio CD tonight. That means that I can match my mistakes in hitting the track indicator with the track listing. This in turn means that I can finally finish the text files and send them to the printer. In case you are wondering what the Pirate Radio Annual is, it's a paperback book with an 5.5" x 8.5" trim size. This is the 4th edition. Each are divided into two parts: the first is pirate radio "articles" and the second part of the book is a listing of entries on North American shortwave pirate stations that were reported in the past year (and also European pirates that were reported in a large portion of North America). The book contains images from dozens of stations + contact information, URLs of websites, etc. The "articles" in this year's edition include "Dutch pirate radio, 1931–1967" by Kai Salvesen, "Shortwave Pirate Radio 2012: A Year in Review" by Chris Smolinski, "Internet Resources" (for listening), and "Recording and Archiving Pirate Radio for Future Generations." My apologies for the delays in producing this year's edition! It's been a challenge! broken with few transmissions earlier this year with a broken antenna. 48mb (6205/6210/6220/6260/6270/6305/6310 kHz)with 60 watts max. power. 6290-7.40 Radio Waves International Playing Country Music. Weak Signal Sinpo 33322. Also On 11401.